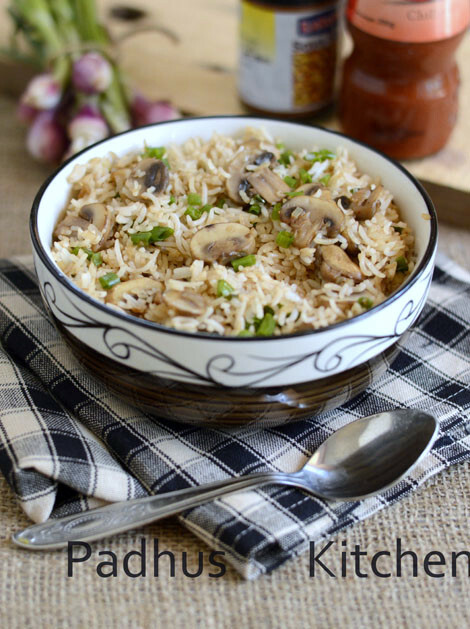 Mushroom fried rice is very easy to prepare and also very popular among kids and adults. I made this mushroom fried rice with vegetable manchurian as side dish. The combination was great and we all enjoyed it a lot. You do not have to go to the restaurant to eat mushroom fried rice when you can make it easily at home to suit your taste. It is also great way to use up leftover rice. Today we will learn how to make mushroom fried rice-Indian style following our easy recipe. Soak basmati rice for 20 minutes, drain the water completely and cook with 1 3/4 cup of water and a little salt. Cook it in such a way that each grain is separate. I added 1 3/4 cup of water for 1 cup of rice and cooked in a pan with lid. Once cooked, fluff it with a fork and spread it on a plate to cool. Clean mushrooms, pat it dry and cut it into big pieces. Finely chop ginger, garlic, green chilli and onions. Heat a tbsp of oil in a pan, add onions, garlic and saute until onions turn transparent. Add finely chopped ginger, green chillies, spring onion greens and saute for a few more seconds. Add mushrooms and cook until mushroom becomes soft. Then add cooked rice, soya sauce, chilli sauce, salt, pepper powder and saute on high flame for 2 minutes. Switch off the flame and garnish with spring onion greens. Serve hot with gobi manchurian or chilli paneer or vegetable manchurian. Note - Sauces can be increased or decreased according to individual preferences. Leftover rice or brown rice can also be used for this recipe. Variations -You can add scrambled eggs and make mushroom egg fried rice also. wow very tempting.. just love mushrooms..and they perfectly cooked.. I made mushroom fried rice along side vegetable Manchurian both turned out really nice and family loved it once again thank you so much keep up the good work best wishes!!!!!! !